Grizzly Nights | Great Yoga. Great Timas. Chances are that you tend to gravitate toward just a handful of colors when it comes to the primary pieces in your wardrobe. They may be some combination of creamy beiges, deep charcoals, inky blacks, and earthy browns. Particularly during fall, emphasizing a collection of neutral workout clothing can be simple and elegant if you have the right pieces at your disposal. If you need a few suggestions for making the most of your fall neutrals, look no further than these four ways to help them stand out. All you need are the right accessories to make your black yoga leggings pop during this chillier time of the year. A great way to make your fall neutrals stand out from the rest is to add a little bit of sparkle that catches the sunlight. 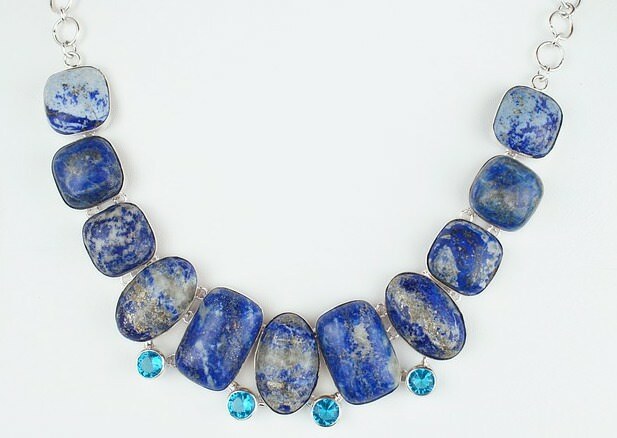 This is a great time for shiny metal jewelry like chunky bracelets, gemstone necklaces, and glittery earrings. A pop of metal, no matter what color, will go a long way toward highlighting the neutrality of your wardrobe in a timeless and effortless manner. Have you always wondered whether or not you have what it takes to pull off a hat? Fall is the perfect time of the year to try out different styles and shapes. Purchase a variety of hats in bold fall colors such as rustic orange and olive green to make them stand out against a backdrop of beige, gray, and brown. Slouchy beanies are a particularly cute option for the fall because they add an additional layer of warmth. A knitted beanie can make any outfit appear instantly cozier for an ultra-casual look. Fall can often fade into winter rather quickly, which means that your wardrobe needs to be ready for the cold. 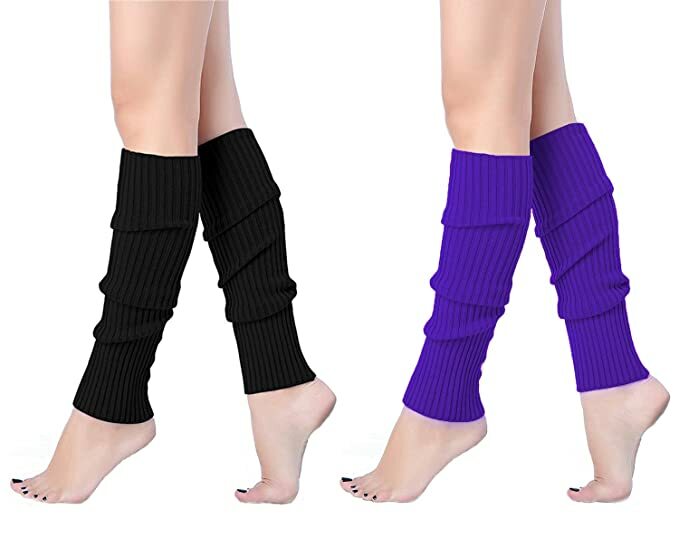 Pairing dark yoga leggings or compression pants with rustic-colored leg warmers is a great way to introduce a little color and liven up a neutral wardrobe. Chunky knitted patterns with intricate details have the potential to add a level of finesse that will make your outfit feel whimsical and polished at the same time. An oversized open-front cardigan in a warm and fun shade for the fall is great for blustery mornings and evenings when the temperatures start to drop. The extra size and fabric help to balance out the snugness of a quality pair of yoga leggings. 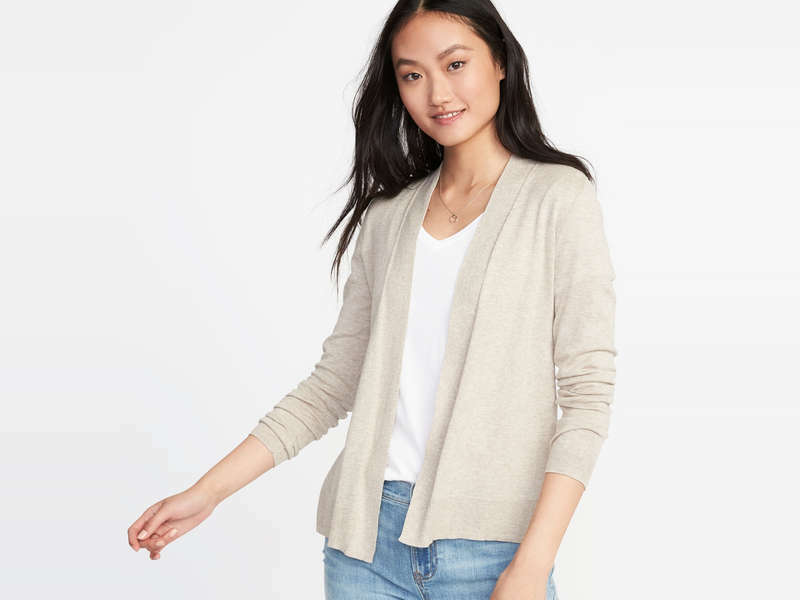 An open-front cardigan allows you to keep showing off the neutral tops you own while making them appear different with each outfit. Purchase a cardigan with a thick and textured fabric that is visually interesting to pair with an otherwise plain outfit. Don’t forget that fall is a great time to have a little fun with your fashion. 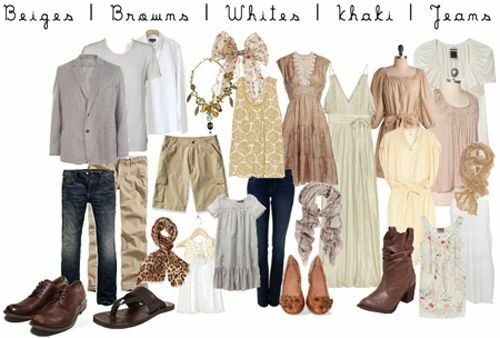 You can mix and match these tips for making your neutral items pop or use them all at once. Yoga fashion can be chic year-round, even when you own mostly neutrals. Summertime calls for warm colors and spices. One that boasts both qualities is definitely turmeric. I found turmeric a long time ago. We were traveling through the Middle East with my parents and we all fell in love with both the taste and its positive effects. Over the years, we’ve incorporated it into a lot of meals and here are just some of my favorite ways to prepare foods with it. Turmeric is a great “pick me up” spice for when you’re feeling a little run down or when you feel a cold coming. I use this quick fix to boost up my immune system. It is called turmeric milk. To make one, heat up some non-dairy milk (I recommend oat, but you can use almond, rice, coconut or whichever you prefer best), add a little coconut oil (it contains tons of healthy fats), and good splashes of turmeric and cinnamon. Stir together and enjoy. I like to enjoy my warm cup of turmeric milk either first thing in the morning or the last thing before bed. Just one small coffee cup instantly makes me feel stronger and it curbs my sugar cravings. To enjoy as a spice, keep in mind that for maximizing its health potential, turmeric should be heated up. But sadly, curcumin that is the main active ingredient in turmeric, is poorly absorbed into our bloodstream. That is why it is recommended for pairing with black pepper. Black pepper contains piperine which is a natural substance that enhances the absorption of curcumin by 2000%. Curcumin is also fat soluble – that’s why half a tablespoon of coconut oil in your turmeric milk will actually help you absorb all the goodness from turmeric. 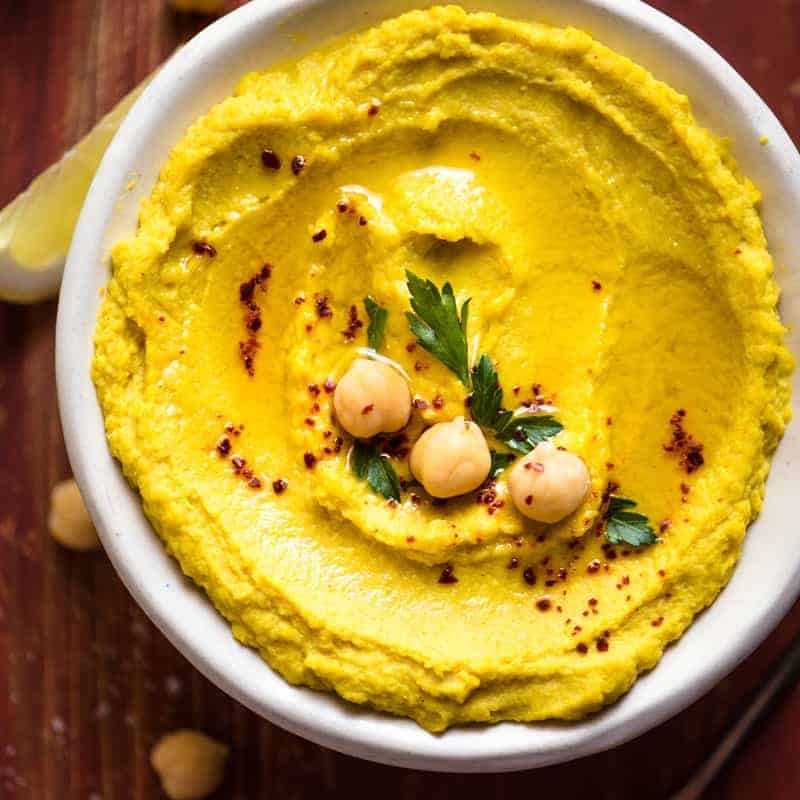 Another fairly simple recipe is hummus with turmeric. I prefer raw garbanzo beans instead of the canned alternative. Just soak them overnight and cook until softened in salted water to which I add a fair amount of turmeric. Then, drain and let cool. A wise tip is leaving some of the liquid which you may dilute later on. Just add olive oil, fresh garlic, tahini, and spices. I like to keep it simple by adding only a pinch of red bell pepper spice. Garnish this with fresh parsley and baked seeds like pine nuts, sunflower, and sesame. Turmeric is moreover packed with antioxidants and therefore considered to be one of the nutritionally most effective spices. 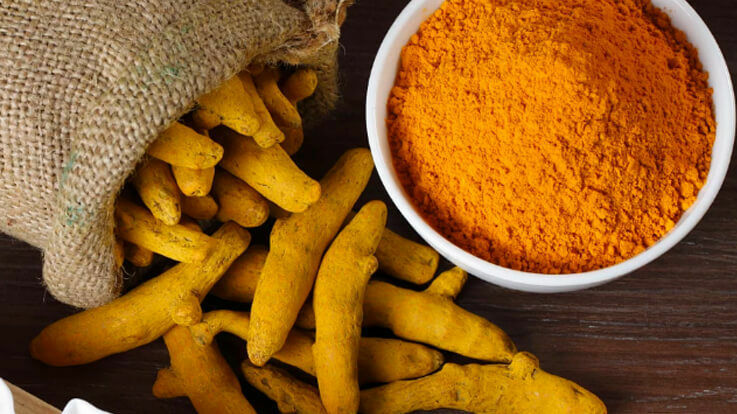 It contains curcuminoids, of which the most important is curcumin boasting with bioactive compounds with powerful medicinal properties as it acts anti-inflammatory. Curcumin is also the one that gives the spice its brightly sunny orange tone. I find that turmeric is an overlooked spice that can complement many of simply prepared dishes like risotto as a side dish to fish. Heat up some ghee butter and add rice, including water which is twice its amount. Bring this to boil and add spices. You may opt to add a pinch of salt, pepper, and turmeric as well. Continue cooking until the rice is softened. For your benefit, it works with any kind of rice and any kind of fat, but I prefer ghee butter as it softens the rice and elevates its flavor nicely. Here are some more facts about turmeric that might make you want to incorporate it into your menu daily. It plays a vital role in repairing damage to your body as for its strong anti-inflammatory properties. It increases the antioxidant capacity of our bodies, as antioxidants protect our bodies from free radicals. It neutralizes free radicals, stimulating the body’s own antioxidant enzymes. Helps prevent (and possibly fight) inflammatory diseases like arthritis. It also has a positive correlation in fighting Alzheimer’s disease as it crosses the blood-brain barrier (Alzheimer’s being a neurodegenerative disease and leading cause of dementia). It moreover works against depression. Maybe you’re curious about its positive effects. Maybe you’re already familiar with it and are on the look for new recipes to incorporate into your menu. Or you might be persuaded with its vibrant inspirational color. Whatever it is, I would love to hear your experience. As well as what spice is the one you can’t imagine preparing your foods without and why. Looking forward to hearing from you. The rise of the yoga mat came in 1968 when renowned yoga teacher Angela Farmer ran into a piece of underlay from a carpet factory, which serendipitously became the solution to her medical condition of not being able to sweat from her hands and feet that often interfered with her practice. Soon, her relieving underlay became popular amongst many of her students, eventually making her the first yoga mat retailer. Who would have expected that this specific therapeutic intervention would later become part of the status quo surrounding yoga, at least in the Western part of our world? This is something that quickly makes us think whether or not this object was merely a trend that overstayed its welcome tricking us into thinking that we need it when we actually do not, or if it is truly something essential to our practice. Surely, you will end up listening to countless answers to this puzzling statement; but in this article we will allow you to make up your own mind giving you both sides of the coin: the pros and cons of yoga mats. For many, just as for Angela Farmer, mats allow them to have a good grip while either maintaining a pose and/or transitioning in between poses; whether the cause of this problem is a medical condition, unsuitable flooring for yoga or a simple preference it is one of the pluses offered by this accessory. Another important benefit is cushioning. Pulling off a Sirsasana or “head stand” with a headrest is not the same as doing one without any and this applies to other simpler poses. Feeling comfortable while doing yoga is amongst this practice’s most basic elements and a cozy surface is always essential. Hygiene is also another factor many take into account when deciding to use the yoga mat. It is clear that most people do not like practicing yoga on a surface where other individuals have spent the last hour or so rubbing their sweaty bodies against; and that is entirely understandable. The mat aids with solving this problem by simultaneously having the added advantage of delineating our own personal space during over-crowded lessons. There is an elementary reason why yoga mats seem to be counterproductive at times, and that is the argument of strength vs. flexibility. When surfaces on which we practice are stable, for example, yoga requires more strength than flexibility; if the surfaces on which we practice yoga are unstable however, then many postures end up requiring more flexibility than strength. With most yoga mats being quite stretchable, this characteristic often presents a problem. By leaning your weight onto the flexible mat rather than using your muscles to stop yourself from slipping, you are continuously altering poses and straining parts of your body that are not supposed to be placed under such tension; something that could later on result on knee or hip issues amongst others. An additional problem revolving yoga mats is the weak connection your feet, hands, and at times body as with the actual ground, making it harder for you to connect with the ground; which will be proved by how much harder it is to find equilibrium when attempting balancing poses such as Vrksasana or “tree pose,” Vasisthasana or “side plank pose” and so on. Lastly, when speaking about a practice that seeks harmony, connection and union within and without ourselves some criticize the fact of practitioners candidly seeking to delimitate their own practice space; seeming quite ironic and paradoxical. Overall, choosing whether or not to include a yoga mat as the side-kick to your practice will depend on your own needs and circumstances; simply try it with and without, see what works best for you and be conscious of the factors that pushed you into making that final decision. Imagine for a moment that instead of heading to your local pub for a bottle of beer with your buddies, you head to a yoga class for it. Better still, instead of just walking into the class and ordering a bottle or two, you ask the yoga teacher to manage your activity and reward you with a sip every time you do achieve a milestone. Well, imagine no more because beer yoga – beer taken during or after a yoga class, is a reality. Driven by an age-old love for beer in a country like Germany, yogi trainers saw an opportunity to marry both forms of body therapy. Now, the trend has caught on surprisingly fast in various countries around the world. The trend was founded by two certified yoga teachers, Emily and Jhula, who also happen to love beer. The idea was born after Jhula happened to see an almost similar concept in Burning Man, back in 2015. That was when they launched their brand BierYoga, which has caught on very well in various continents. The duo first sold their idea to the public in Berlin, Germany for the first 12 months. Once the trend caught on, they started doing tours in other parts of the world starting with Australia. Now, beer yoga classes are catching on fast in various parts of the US. In Chicago, it’s mainly the beer companies that are leading the way. By utilizing the open spaces that they have in their factories, they are hosting yoga classes while offering their beer. It is now not uncommon to see teams of between 10-25 people doing yoga in brewery spaces, surrounded by barrels and tanks of beer. The yoga class attendees are required to either bring their own mats or to rent one at a fee. For example, the Begyle Brewing Company located in Ravenswood, Chicago, offers a one-hour yoga class every Saturday for a fee of $20. This amount caters for the training charges and beer. The company has found a way of advertising their beer and offering it to beer lovers in exchange for a small fee and a yoga class. Considering that this is a growing trend, the beer companies that have tapped into it can only expect to do better in coming days. The idea is that this combination will help break the barriers of engaging in yoga for those who are intimidated to do so. The classes offer fun, and they are a way to still have the company of friends while keeping fit. Worried that you may not be able to balance while tipsy? Well, that’s beside the point. 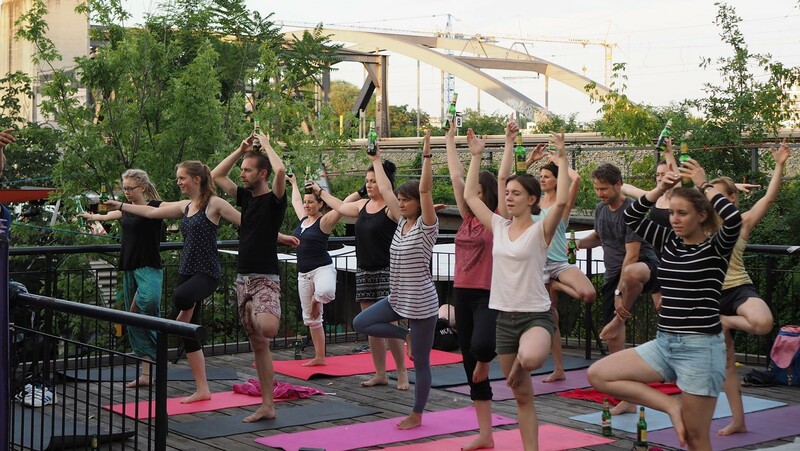 Most classes are tailored to accommodate both beer and yoga, have fun, and keep everyone safe. How the beer sipping and doing yoga is organized depends on either the trainer or the hosting beer company. There are those who offer beer after each successful pose. There are also those who integrate beer in the poses; such as balancing the beer bottle on the head. There are still those that offer beer after the yoga sessions are complete. Just how far this trend will go or how long it will last is a wait and see affair. If you have ever visited a yoga center, you have probably started with, or relaxed at the end of the session, with the mantra Om (ॐ). But have you ever wondered what it means and where it comes from? The Sanskrit original word for the westernized “Om” is AUM, and it is described, among other ways, as the original sound. The sound that was born with the universe. Its three letters represent creation, preservation, and destruction. When done properly, the Om sound created by our own throats resonates from the pelvic floor upwards through the crown of the head, filling the body with vibrant energy that empowers us and, at the same time, radiates tranquility. In addition, it is said that the Om mantra increases self-awareness and concentration in your most intimate spiritual world. Now that we know the phonetics of Om, let’s move on to the visualization or the feeling of each sound. To sound the first two syllables, open the mouth wide as if you want to swallow the whole universe. When you start chanting, imagine that the first vowel (“a”) appears around your bellybutton, and the sound waves irradiate to your pelvic floor and your lower chest. Then it grows towards the second syllable, slowly moving the place of the sound to your throat, and allowing the sound to massage your heart, thymus, and thyroid on its way up. Finally, gently close your lips for the final syllable [m], allowing the sound to move from the throat up. The vibration of the [m] sound then resonates within your skull, massaging your pineal and pituitary glands, to finally reaching the crown of the head. The movement of the mantra Om through your body is often associated with the chakras, or energy centers and their colors. So, you can also practice visualizing these colors when you chant: inhale through the back of your body to open those places where tension is locked and then visualizing Yellow, which is the color for the Manipura chakra where Om is originated. Then green (heart), sky blue (throat), Indigo (third eye), and Purple (crown of the head) when the sound travels up. It is believed that the power of the Om mantra is so great that even staring and taking in the Om symbol (ॐ) can exert a positive influence. You can even chant the mantra in silence, in your own mind to regain calmness! Pronounced or written, the Om mantra is one of the essential aspects of yoga and one of the most important stages for the understanding of yoga. I hope you enjoy this practice. Just try to chant it 24 times in a row to see the benefits!